When chain restaurants open, one of the biggest problem that needs to be overcome is consistency. So the question is 'can a oversea franchise that is 14,000km away really carry the same quality and taste as the original?' With that question in mind, R and I drove some 200km to find the answer in Bellevue. We arrived there around 11:30 to find a large crowd. They give us a menu along with a number at the top and told us the wait is approximately 30 minute. 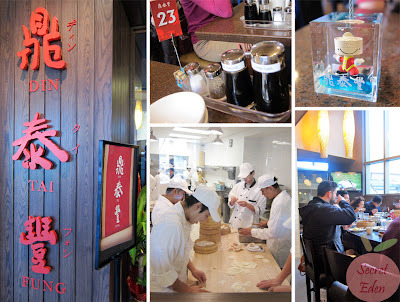 With fresh memories from our visit to the original DTF in Taiwan, I did notice 2 major differences. One look through the glass window into the kitchen, I noticed the majority of the people working are not Asian. So the question of authenticity arises. However base on what I saw, they were all quite professional. Another thing is if you look closely at the picture, you will notice that all the people in the kitchen did not wear face mask, where as the ones in Taiwan did. One more thing that surprised me was the addition of a bar. It was quite a site to see people enjoying xiao long bao (XLB) while sipping alcohol and watching ESPN. Since only water is provided, R and I both ordered tea. I went for the jasmine and R went for the dragon well ($2.50). 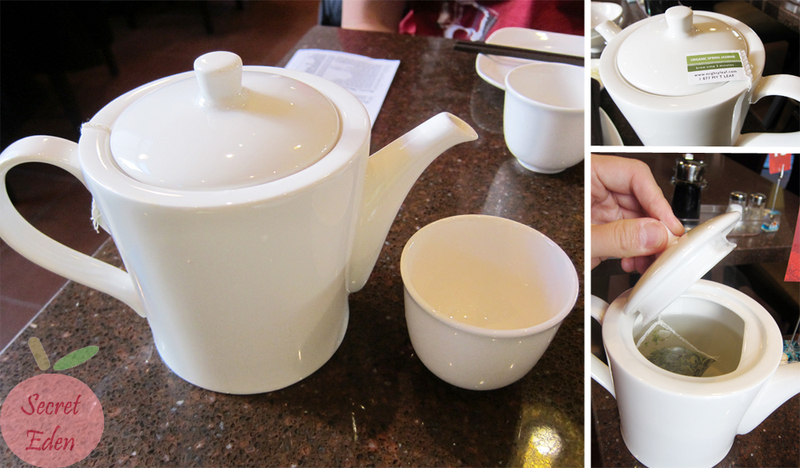 We initial thought the tea was per cup, but it was actually per pot. Although the tea was good and organic, but I am a little disappointed to see it's a tea bag. Of course, this time I ordered their regular XLB for $9.50. I'd say the price is not too bad in North America, because I think a steamer in TW was around $7.50. 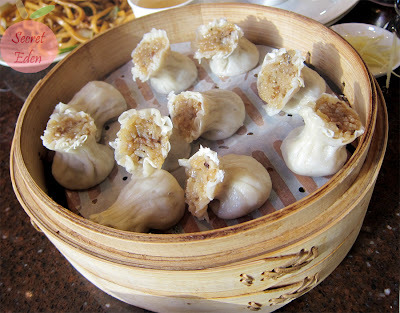 The buns were indeed quite good and very similar to the ones in TW in terms of the skin. There 2 major differences between these and the ones in Vancouver (ex. Shanghai Village). 1. The soup is completely clear and not oily at all, but there isn't as much comparing with Van. 2. The skin is really thin, but at the same time quite dense, meaning it's more stretchy/chewier, and hold it's shape very well. They are not easily ripped at all. Personally, R and I both think they use a more glutinous flour instead of the regular all purpose. Although these are good, but there was a small issue: these weren't served hot. I mean they were warm, but not piping hot. Maybe it was done on purpose, so that the customer don't burn themselves when consuming, but still I would prefer it to be hot. We were debating between the steam dumpling or the sui mai, and finally settled with the sticky rice/pork sui mai for $10.25. When they brought over the sui mai, they placed under the XLB steamer, thus got squished. They were really good as well. The sticky rice is soft and flavorful with bit of pork scattered amongst it. R don't eat beef, but he heard they have really good beef noodle. They have a plain steam version and a braised spicy version, I went with the latter ($8.50). 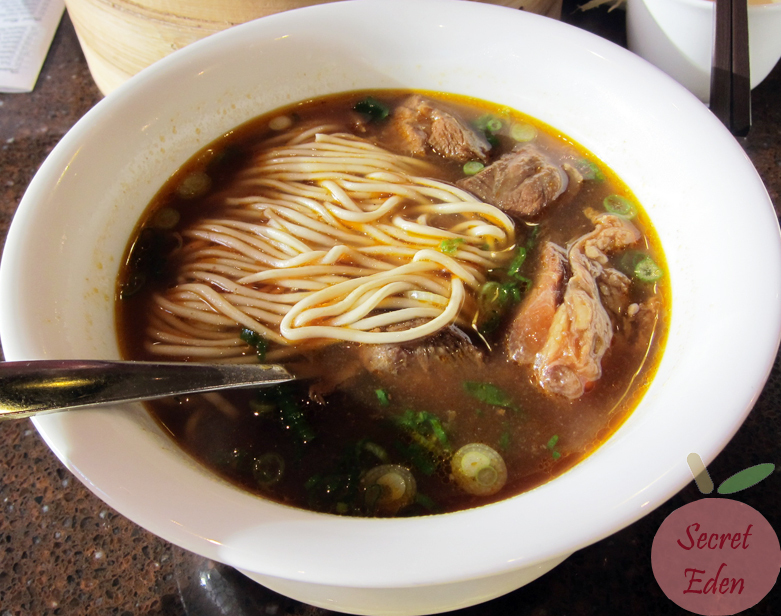 I have to say, this was good as well, the soup was beefy and delicious with nice chunky, but soft beef briskets. The noodle used was the same type as the ones in TW. 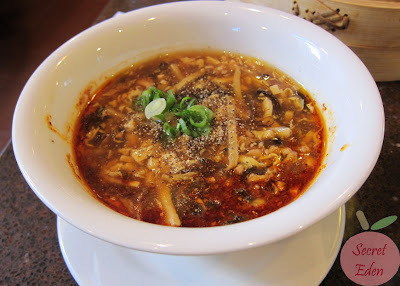 The soup was only slightly spicy to me, but it could be consider spicy to others. 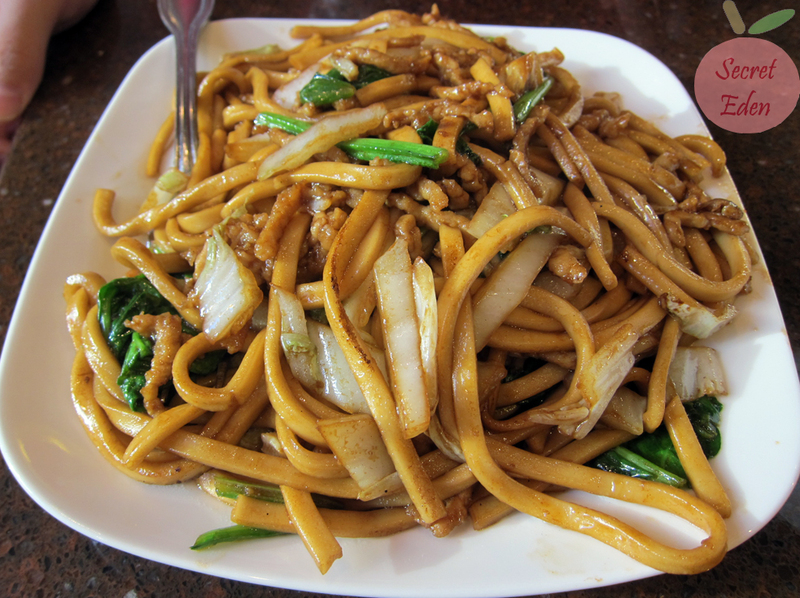 R wanted try a noodle, but wanted a dry version, so he went with the stir fried pork noodle ($8.50). This was disappointing in comparison with everything else. It was plain, and nothing special at all. The flavor was you can typically find in any Chinese restaurant. At this point, we were quite full, but we had to get one thing that we had in TW just so we can do a thorough comparison. You had a choice between small, medium or large, we went with the small for $3.75. For a small, this was pretty good portion and price. It could fill about 4 regular Chinese rice bowls. The soup itself was quite similar in taste, so the consistency was definitely there. The only difference was the addition of the pork blood. Service here was good, they hired many people of different ethnicity, so that communication wouldn't be a problem for majority of the diners. The only problem I had with service was their hostess. They were nice, but not very organized. They told us the wait was 30 minutes, but in fact it was more like an hour. The table next to us complained to their manager and received a free soup. Personally, I think they should tell customers a longer wait time than expected, so if they get seated earlier, they would actually be happy instead of being pissed. Overall, I think the food here is worth the drive down. I recommend their steamed items, as they are indeed very good. Since they don't take reservation, I would suggest to go before or after meal times, meaning if you go for lunch, go before 11:30 or after 1:30. Also, if you go on weekend, parking under Lincoln Square is free. Something similar happened to me: I had to wait way over an hour, after been told of a 30 minutes wait. I would go if I happen to be in the area; however, otherwise, not sure if it is worth the drive considering what we have here. But then, again, it is me! We waited for more than an hour when we went last month and it was way past the lunch hours. Finally got seated at 315pm. I've tried most items on their menu at Bellevue location, the only 2 items I really like are fish dumplings (very refreshing, highly recommended)and their specialty soup dumplings. Everything else is mediocre. To be honest, I find DTF in Taiwan/Hong Kong are much better than their N.A cousins. I also don't feel its worth the drive base on personal experience...We are so blessed to live in a city such as Vancouver, our Chinese food really are superior than what they offer down south. I'd say the best ethic cuisines Seattle has to offers is Korean food! DTF validates parking downstairs for up to 3 hours (during weekdays, I've never been there during weekend tho), make sure you give your parking stub to the waiter/waitress when your bill comes.